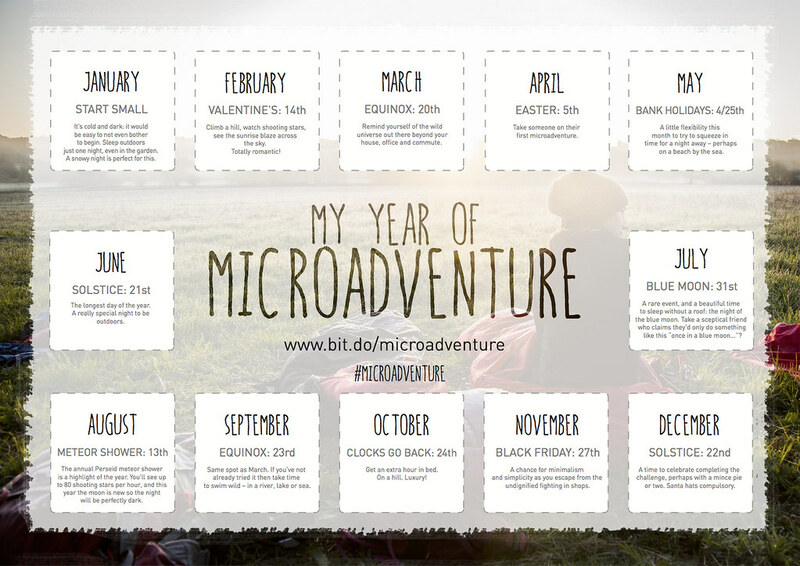 I began the Year of Microadventure campaign to challenge people to spend one night a month out in the wild. I knew full well that only a certain breed of person would be up for sleeping on a hill in January or February! That doesn’t matter at all – people can begin “their year” in any month they fancy. I always knew that the campaign would begin in earnest in March. I challenge you to remind yourself of the wild universe out there beyond your house, office and commute and get involved in a microadventure this month. The weekend of March 20-22 is the weekend of the equinox. The equinox is when the hours of daylight and darkness are equal. There is a spring and autumn equinox. The days are lengthening now – towards the summer solstice (the longest day), after which they will dwindle towards the winter solstice. These four dates – the equinoxes and solstices [solstii??] – are key components of our challenge this year. We’re going to sleep out on each one. To appreciate the way the world changes over the course of the year, I suggest that you go for your microadventure in the same spot for each of these dates. See how different it feels in spring, summer, autumn and winter. Do it with the same friends each time; do it with different people each time; do it by yourself – whatever you wish. Returning to the same spot four times in the year also makes the planning and organising of the year much easier. On Friday 20th March there is also a major solar eclipse. Even people who pay zero attention to the natural world will – if only briefly – observe the wild universe beyond their double glazing. And that Friday or Saturday night is when we are going to do our March microadventure. Think of a convenient but beautiful place you’d like to go to. Remember that you will be going there four times this year in spring, summer, autumn and winter so try to pick somewhere that will work well and look good in all seasons. (For example, I’mm looking forward to observing how different the trees look over the four seasons). Make it simple enough so that you actually do it. This is a great chance for all the Facebook Groups to spring into action and perhaps arrange a communal meeting point. If you are new to microadventures, here is all the info you’ll need to make this easy, fun, comfortable and safe for you. My friends at Alpkit have put together this great bundle of Microadventure kit if you need to buy anything. Whatever you choose to do, please share your photos on the Facebook page and use the #microadventure hashtag on Instagram and Twitter. I’mm looking forward to seeing what everyone gets up to! If you’re not able to commit to a night out every month, then this is a great chance to at least get out once a season. Please share this with any folk who might enjoy it too. The more the merrier! And if you haven’t bought the Microadventures book, please do! It’s ace. I think. Hi Alistair, thanks for the inspiration! I loaded up the bikes with the help of my two sons, aged 19 and 12. We took a tent which was way too big but it balanced across my two back panniers which were full of sleeping bags and mats. We cycled about 6.5 miles from home had a lovely evening meal in a pub, stayed overnight, had breakfast, packed up and came home. I never loaded up my bike with so much stuff and it was only really when we set off I realised how light the front end was, it was manageable but I think I’ll invest in front panniers for future trips. We had an adventure! Thank you!